eWay-CRM website allows you to download eWay-CRM Free and eWay-CRM Premium Trial. 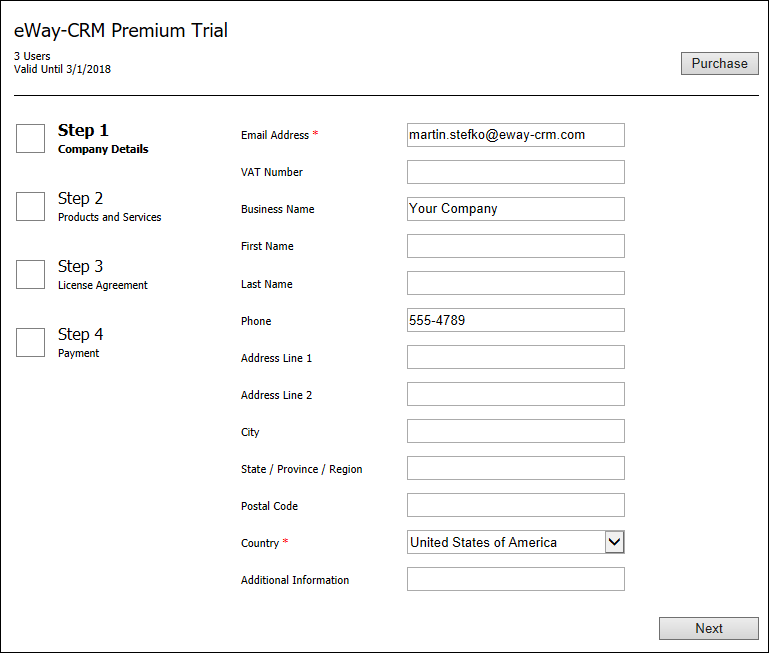 eWay-CRM Free is intended for one user and eWay-CRM Premium Trial is full version (including eWay-CRM Mobile) for 30 days. If you decide to continue with eWay-CRM, you can easily purchase eWay-CRM Premium right in the application. There are two ways to get into the purchase section. 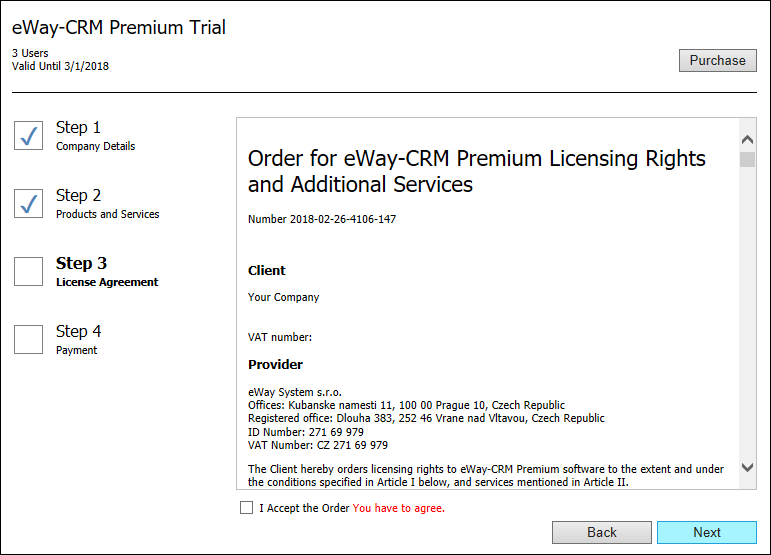 The easiest is to click the Purchase button in the eWay-CRM ribbon. You can also login to Administration Application and go to the Purchase section to reach the same result. You need to fill in contact information in the first step of the purchase. 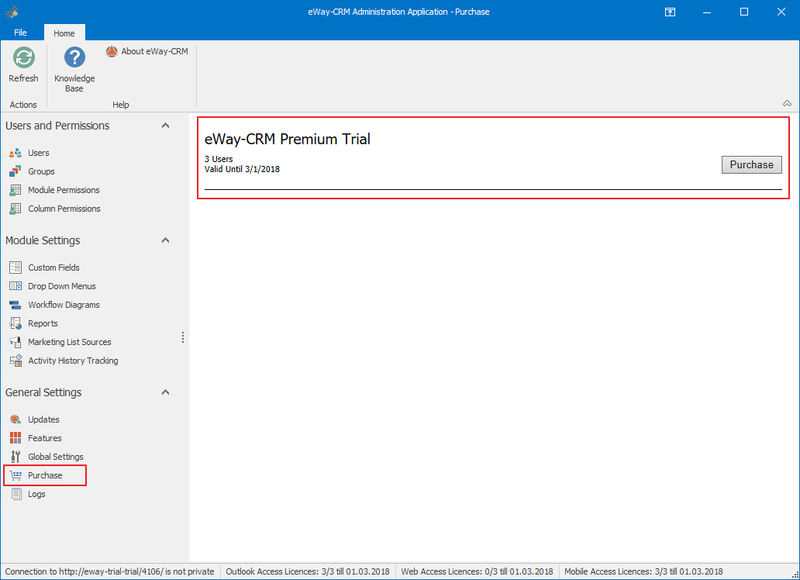 Fields are prefilled by credentials you insert during the eWay-CRM registration (see Create eWay-CRM Account and Connect to Database). Mandatory fields are Email Address and Country, but you can add in other credentials for easier communication. If the form is filled correctly, please go on by pressing Next. You can specify the number of users in the new window. This is the number of persons who will be able to use eWay-CRM Premium. You can edit the number to fit your current needs. The dialog also contains the summary of the order and the final price. If you are satisfied with your choice, please go on by clicking Next. If you want to go back to the previous step, please click Back. Please, read the license agreement properly. If you did so, you need to mark I Accept the Order check box. If you tried to continue without marking the field, the form wouldn't allow you to and you would see the red note (as in the picture below). If you agree and you marked the check box, please go on by clicking Next. This is the final phase where you use PayPal or your debit/credit card for the payment. 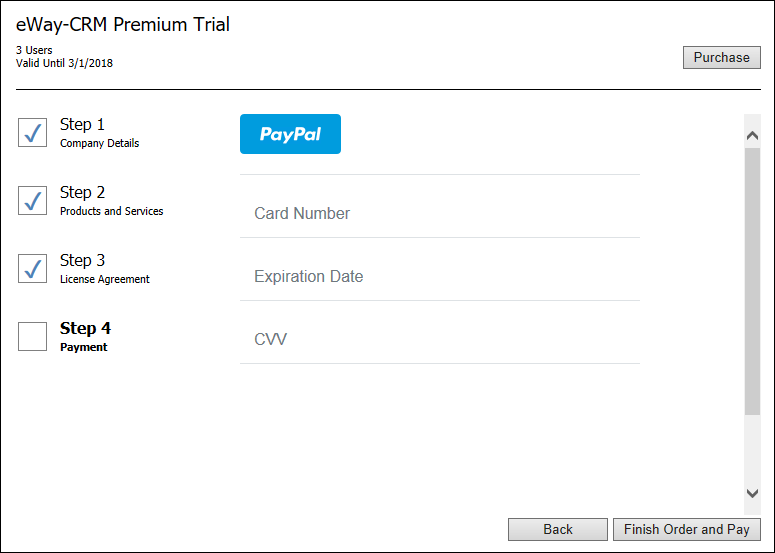 Click the PayPal button and PayPal login window will pop up. Fill in login credentials as you are used to when you are logging in to your PayPal account. The service is provided by PayPal and its safety is guaranteed. If you want to use your debit/credit card, just insert card information - card number, expiration date and CVV. When you select payment method, finish the process by clicking Finish Order and Pay. The payment will be withdrawn from your PayPal account or debit/credit card and your eWay-CRM Premium license will be paid. The purchase should successfully end and you will be able to use your eWay-CRM Premium with all its functions. Open eWay-CRM Settings and continue to the tab Connection. Make sure that “hosting” is included into your Web Service Address. If so, it means that your eWay-CRM has been moved to the live environment. You will receive the invoice within 1-2 days after the purchase. 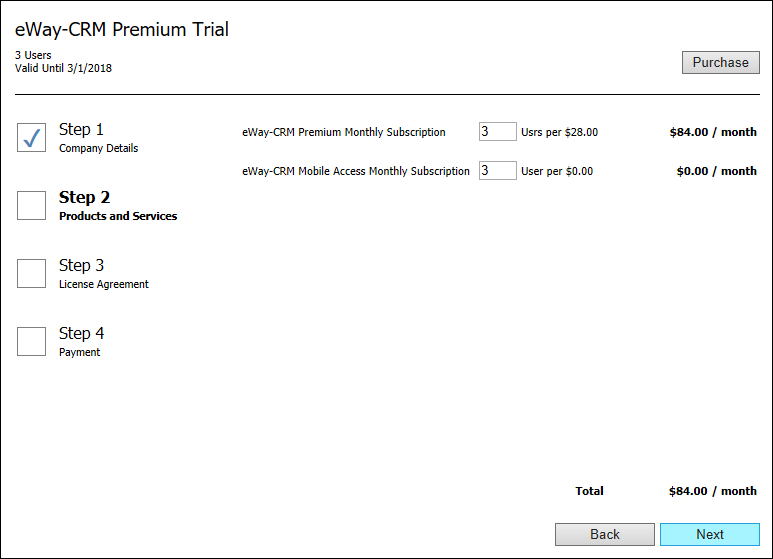 Availability: Purchases History and option of changing plan and payment method are available since eWay-CRM 5.2.0. When your purchase was success, in the Purchase section in Administration Application, you can see Purchases History table. When you click View Online link, you will see the invoice for the specific period of your subscription. As payments will be made for each period, new invoices will be available in this section. 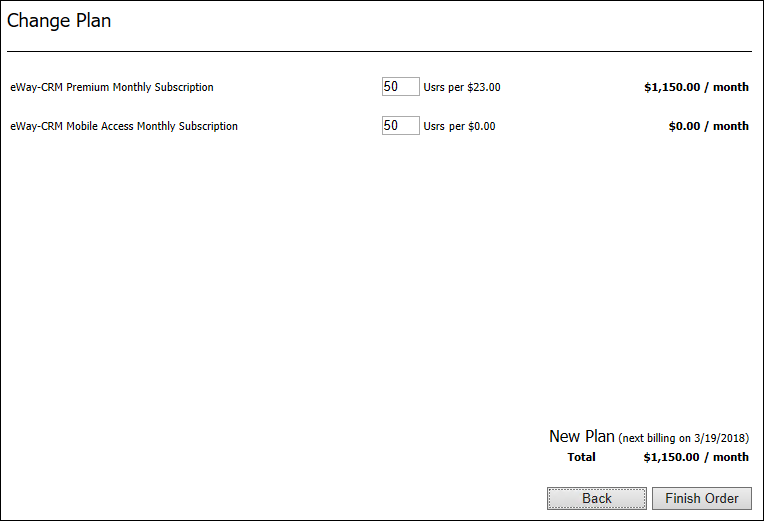 After purchase, not only purchases history is available, but you can also change your subscription plan or change the payment method. If you click the Change Plan button, you will see a dialog where you can change number of your licenses. You can increase or decrease their amount. Licenses for eWay-CRM Mobile cannot be changed, their number is automatically set same as number of eWay-CRM Premium licenses. Confirm your choice by clicking Finish Order. If you increased the number of licenses, the new invoice will be issued, but only for the amount of licenses you added to ones you already paid. If you decreased the number of licenses, the new amount of licenses will be invoiced at the beginning of the next subscription period, until then, you can use all licenses you have. Add New You can add other payment method - credit/debit card or PayPal account. Newly added payment method will be automatically set as Active. Set as Active Selected payment method will be set as Active. Next payment will be made from this card/PayPal account. Only one method can be set as Active. Delete The payment method will be removed from the list. Active payment method cannot be removed. When you subscribe the payment, the system will be set to automatically charge next license when it will be needed due to the expiration of the last payment. If you want to cancel the subscription, you can click Unsubscribe in Administration Application. But remember that when the license is expired, you cannot use all functions of eWay-CRM. If you unsubscribe your payment, you can always pay it again.